The Cleveland Browns return home on Sunday looking for their first win in almost a month as they take on the Seattle Seahawks. Can the Browns actually score some points in the first quarter? So far this season they scored three points total in the first quarter, the lowest amount possible for an offense to score. Seattle, which beat the Giants on the road in their last game, have won two consecutive road games since late in 2007. In addition to their regular offensive struggles, the Browns are going to be tested by the Seahawks’ rush defense, ranked 8th in the league. Seattle leads the NFL in rushing average, giving up just 3.1 yards per carry, and haven’t given up more than 70 yards to a running back all season. 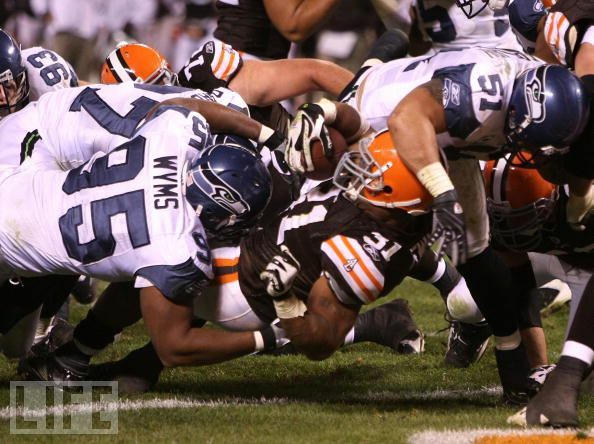 Compounding the problem, Peyton Hillis is questionable with a hamstring injury. The Browns may be catching a break as the Seahawks will start backup quarterback Charlie Whitehurst. Normal starter Tavaris Jackson is one of the worst quarterbacks in the league, so what does that say about his backup? Of course, the last time Whitehurst started a game for an injured quarterback, he threw for 192 yards and a touchdown to help Seattle beat St. Louis and win the division. Not helping matters is that linebacker Scott Fujita is out and cornerback Joe Haden is questionable after not playing last week. That’s a tough one. When we think of the Browns playing the Seahawks we mostly think of Todd Philcox in 1993. We completely forgot about the game in 1994 where the Browns earned a playoff berth. So we’ll go with the 2007 game where the Browns won in overtime. Who knows with this Browns team anymore? The standings say the Seahawks are not very good and they historically struggle when they have to travel East for 1 p.m. games. Of course, they have played a far more difficult schedule than the Browns this year, having faced Pittsburgh, Atlanta, the Giants and San Francisco so far (combined record 16-8). But if a team ever needed a win, it is the Browns after the week they’ve had. Let’s take the Browns to win, but not cover, on a late Phil Dawson field goal. Record picking the Browns (using the point spread) this year: 3-2-0.